The lovable birds were frozen on the telegraph pole. 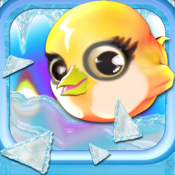 Use the electric power of your finger to help the freezing birds to thaw! Make three of the same color birds in the ice gap, so they have enough power to flee away. Move your fingers swiftly to help more birds. ★Simple and innovative gameplay you hold and love. ★More rich and addictive high quality sounds. ★There are nine kinds of birds with different characters. Which one do you prefer? ★The amazing tools make the game more interesting and addictive. ★Exciting arcade mode. Can you be leaders in the GameCenter? ★Gorgeous graphics for iPad and iPhone with Retina display supported.